Road services in the Gilson, IL area | Johnson Trucking And Black Topping Inc.
Johnson Trucking And Black Topping Inc. If you’ve got a job, we’ve got the equipment you need from asphalt to blacktopping, trucking, and seal coating services. At Johnson Trucking and Blacktopping, we have nearly half a century of experience taking care of everything to do with road services and repairs. We can handle any commercial or residential job, big or small, and we’ll do it for a reasonable rate. Not only are we a trusted manufacturer of Pitch Black® asphalt emulsion sealcoat, but we also offer blacktopping, trucking, and tar services. 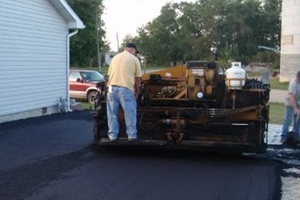 From driveway work to major road rehabilitation projects, we have you covered. The price we quote at the start is the same price you pay at the end—no markups here! We have a solid reputation built on nearly 50 years of top-quality customer service. You can rely on us to do the job right, and if anything isn’t exactly up to your standards, we will make it right at no extra charge. 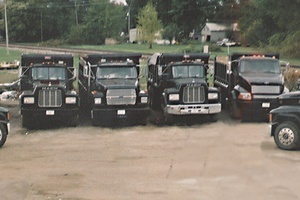 Johnson Trucking and Blacktopping has been in the road business longer than anyone else in the area, since 1968. Larry Johnson founded our company, and his sons Brian (our current president) and Joe continue to be a part of the team. Brian’s son, Dane is also part of the staff, making us a multi-generational company that understands the importance of family and treating customers like they’re a part of ours. We’re truly a family-owned business! Located in Gilson, IL, we’ve been at the same location since the beginning, proudly serving customers in Knox, Fulton, Peoria, Henry, and Mercer Counties. Fully licensed, bonded, and insured with workers’ compensation, Johnson Trucking and Blacktopping is here for you. To inquire about our services, contact us at 309-876-2291 today! Driveways will crack and wear out if not properly protected. Let us help with our professional seal coating services. Johnson Trucking and Blacktopping covers driveways, lanes, and roads alike. We've been paving the way to perfection since 1968. Sand, gravel, rocks, crops, and more – our professional drivers are ready to haul it away and deliver it safely to the final destination.